NMEA 2000 protocols allow engine data to be displayed on NMEA 2000 compliant dashboard electronics, like sonar and GPS. 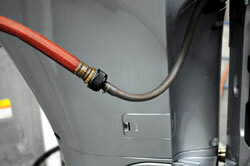 Lean Burn Control® increases fuel efficiency by allowing combustion to operate on a leaner air/fuel mixture. At cruising speed, this engine runs on as much as 20% less fuel* than others in its class. *Based on the EPA's Specific Fuel Consumption Mode. 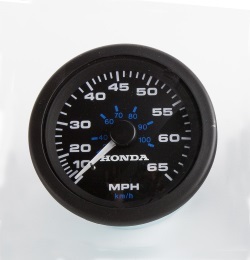 Boosted Low Speed Torque, or BLAST, improves acceleration at low speeds. 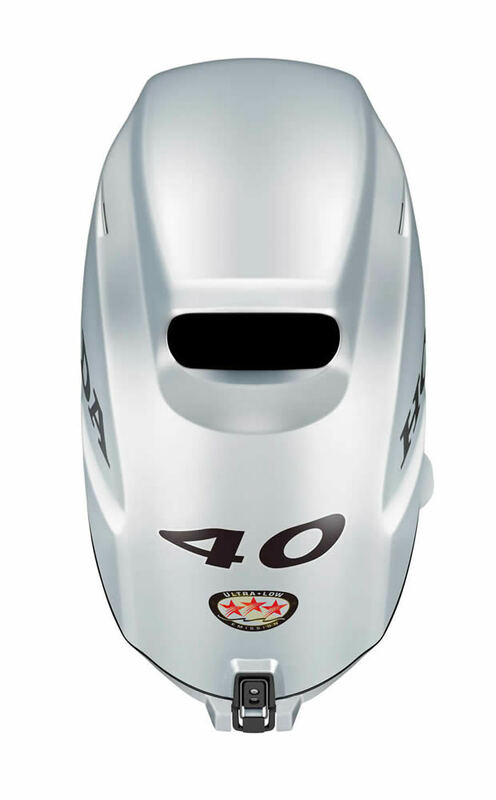 A quick movement of the throttle control activates the BLAST® system, advancing the ignition curve aggressively. "Hole Shot" is vastly improved as more horsepower gets the hull up on plane quicker. Programmed Fuel Injection delivers the precise amount of fuel/air to each cylinder. The result is easy starts and instant throttle response with superior fuel efficiency. There's always plenty of electric power with the 40 and 50hp. 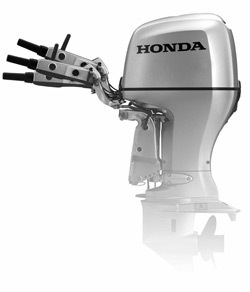 Honda’s innovative technology enables these engines to put out nearly twice as many charging amps as the competition’s. 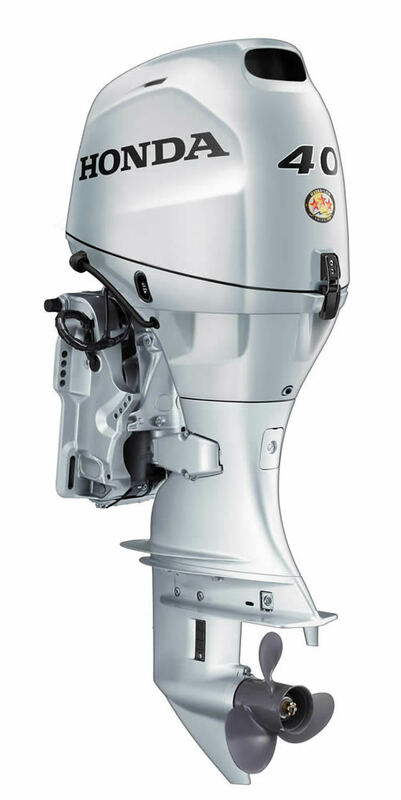 Designed to get you going faster, the BF40 and 50's gearcase reduces drag, greatly reduces hull porpoise and minimizes spray, thus increasing acceleration and top speed. A front splash plate reduces spray from the hull bottom, maintaining a dry deck above. 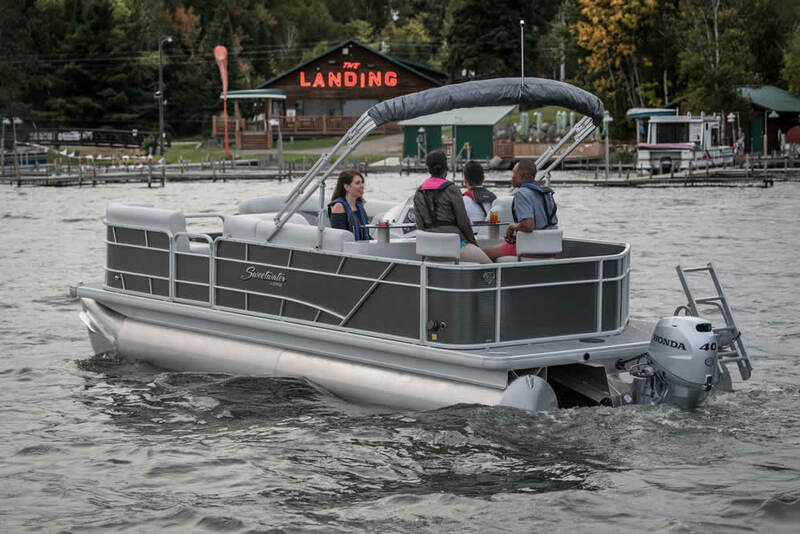 Adjusts to a comfortable angle for easiest hull manueverability. 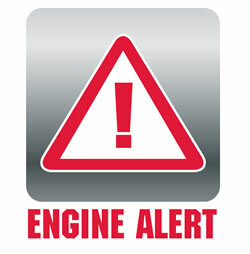 Audio and visual cues combine with RPM reduction circuits to alert the operator of overheating, low oil PSI and over-revving to prevent engine damage. Tiller models feature a new 4-lamp warning system built into the tiller handle, while remote control models deliver alerts via messages through Honda’s multi-function digital gauges or a special indicator built into the unit’s control box. A patented, "Double Sealed" multi-layered paint process. Sacrificial anodes and stainless steel technology, along with waterproof connectors, all enhance corrosion protection. 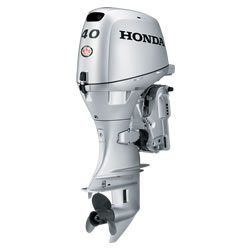 Because of Honda’s elegant design, the BF40 and 50 are the lightest engines in their class. 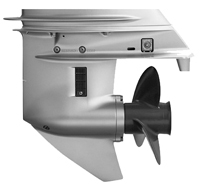 Perfect for aluminum boats, inflatables, skiffs and flats boats. Environmentally conscious technology. 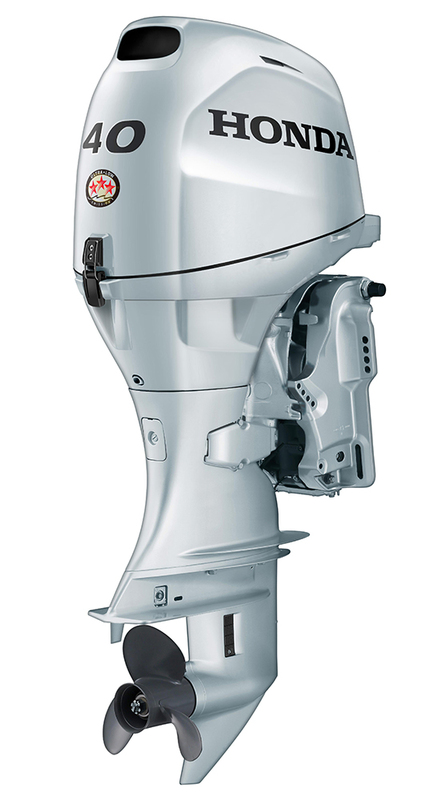 All Honda Marine engines exceed the highest CARB 3-Star rating to meet the rigorous California Air Resource Board's standards. 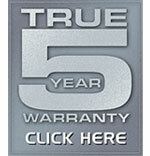 Honda's True 5 Warranty is the best in the business. This transferable, non-declining warranty is the same on the first day as it is on the last. The ergonomically designed tiller handle is longer for improved handling. Adjustments for throttle and steering friction allow easier control. Up front shift lever, PTT switch, and engine alert lamps provide added convenience. Allows you to trim the unit for maximum performance and handling. 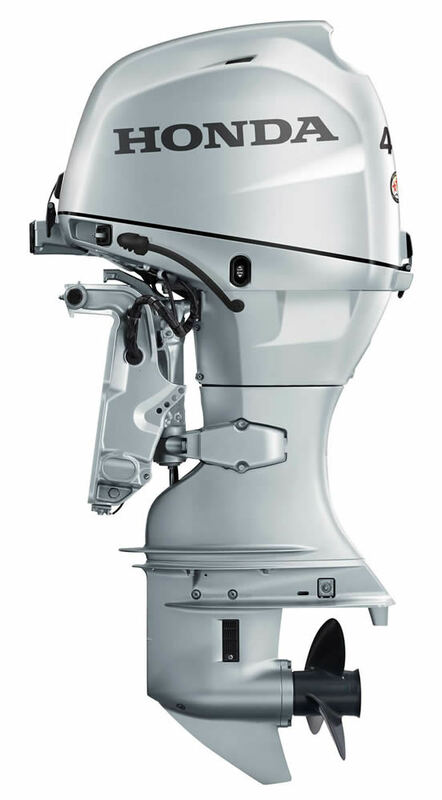 Flushes debris and saltwater out of the engine, extending the life of the outboard. Easy access side-mounted oil filter and oil fillers simplify maintenance, while "screw-type" valve adjusters reduce maintenance costs. 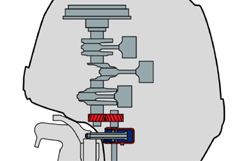 Honda's exclusive crankshaft design locates the powerhead directly over the transom pivot point. This has two effects. 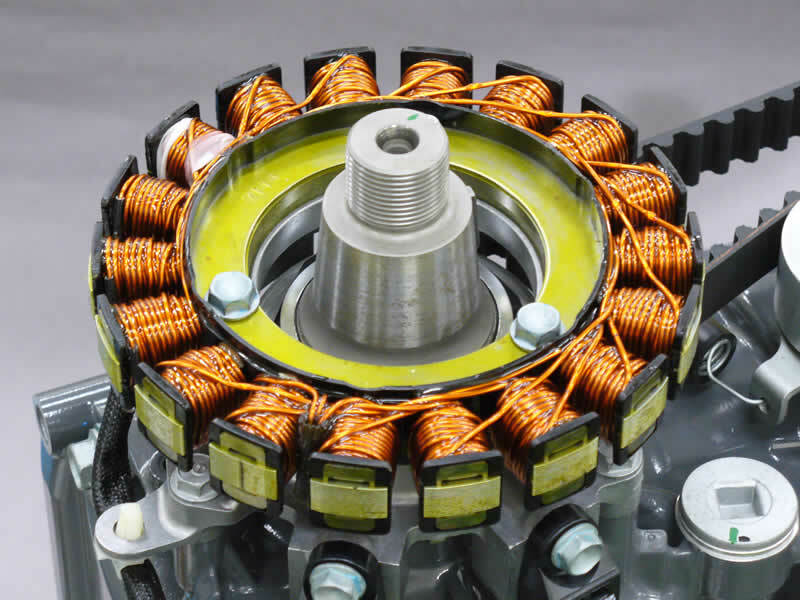 It reduces vibration and improves performance and handling. It also provides for a very compact design. 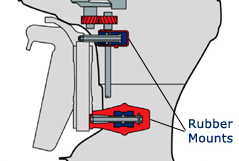 Patented non-linear rubber mounts provide smoother operation at all engine speeds. The lightweight Mikuni long tube intake track system helps build low end torque. Fishermen will appreciate the low trolling speed of the BF40 and 50. Built-in pitot tube in the gear case eliminates the need to drill holes in your boat for installation. Both the BF40 and BF50 are available in 20" shaft models, the BF50 is also available in 25". Type 4-Stroke SOHC, 3 Cylinder, 2 Valves/Cyl.